Trump's nominee to the Supreme Court made the remarks in speaking about Justice Rehnquist, who dissented in the landmark ruling that legalized abortion. Brett Kavanaugh, President Donald Trump's nominee to succeed Anthony Kennedy on the Supreme Court, gave a speech last year in which he seemed to applaud former Chief Justice William Rehnquist for dissenting in Roe v. Wade, the landmark 1973 case that legalized abortion nationwide. The comments, first reported by The Los Angeles Times, may be among one of the few times Kavanaugh has publicly commented on abortion rights, one of the most contentious issues surrounding his confirmation to the high court. Kennedy, a crucial swing vote who sometimes sided with the court's liberal wing on social issues, voted with the majority in Planned Parenthood v. Casey, the 1992 case that reaffirmed Roe. If confirmed, Kavanaugh could provide conservatives with the fifth vote needed to overturn the decision. In remarks last year at the American Enterprise Institute, a conservative think tank, Kavanaugh praised Rehnquist's opinions and noted that Rehnquist, along with Byron White, "ultimately dissented from the court's 7-2 holding recognizing a constitutional right to abortion." The right to an abortion was not in the Bill of Rights, and Rehnquist believed that a new "unenumerated" right should not be found unless it was "rooted in the traditions and conscience of our people," Kavanaugh said. "Given the prevalence of abortion regulations both historically and at the time, Rehnquist said he could not reach such a conclusion about abortion," Kavanaugh said. Nearly two decades after Roe, Rehnquist also dissented in the Planned Parenthood case, a fact that Kavanaugh noted in his speech without specifically identifying Kennedy as the justice who cast the swing vote. "It is fair to say that Justice Rehnquist was not successful in convincing a majority of justices in the context of abortion, either in Roe itself or in the later cases, such as Casey," Kavanaugh said. 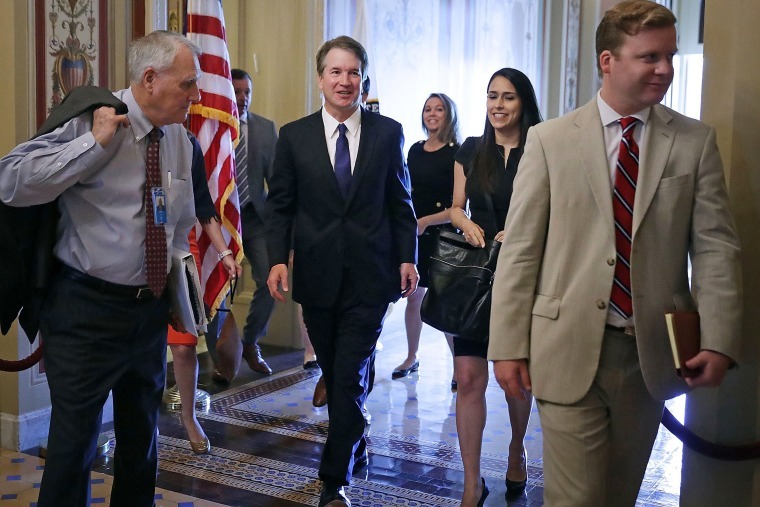 "But he was successful in stemming the general tide of free-wheeling judicial creation of unenumerated rights that were not rooted in the nation's history and tradition," Kavanaugh added, referring to other types of cases. The American Enterprise Institute published a video of Kavanaugh's remarks on its website in a post dated Sept. 18, 2017. The comments come amid intense scrutiny on Kavanaugh's body of legal decisions as a federal appeals court judge. In a case last year, Garza v. Hargan, Kavanaugh dissented from the appeals court’s ruling that an undocumented teenager could temporarily leave government custody to obtain an abortion. In his confirmation hearing in May 2006, Kavanaugh was asked by Sen. Chuck Schumer, D-N.Y., if he considered Roe to be an "abomination." But at a different American Enterprise Institute event in 2016, Kavanaugh suggested that the principle of stare decisis was not "absolute." "I think justices of all stripes agree that stare decisis is important, but not an inextricable command. It’s not inflexible, it’s not absolute," he said.